Bitcoin Cash has recently reached resistance at our expected zone-priced around $641. The market has since retraced to find support close to the 100 days moving average. Support moving forward; $556, $528, $500, $461, $437, $420. Resistance moving forward; $591, $600, $641, $667, $700, $704, $715. Bitcoin Cash has seen a small price drop totaling -3.81% over the past 24 hours for trading. The cryptocurrency is now exchanging hands at a price of $567 per coin after seeing a 7-day price rise of 24%. Bitcoin Cash retains its number 4 ranked position in terms of overall market cap across the entire industry as it holds a total market cap value of $9.89 billion. The 16-month-old coin is now trading at a value that is 86% lower than the all-time high price. Let us continue to analyze price action a little closer over the short term and highlight any potential support and resistance zones moving forward. Analyzing price action from the short term perspective above, we can see that the recent price surge in early November 2018 saw the market rise right up into our expected resistance at the 1.272 Fibonacci Extension level (drawn in blue) priced at $641 before rolling over. We can see that the market has now dropped close to the support provided by the short-term .382 Fibonacci Retracement level (drawn in green) priced at $556.90. The market has stalled at the 7 day EMA around $565. Moving forward, if the bears continue to drive price action below the support at $556 we can expect immediate support beneath to be located at the .5 and .618 Fibonacci Retracement levels (drawn in green) priced at $528 and $500. It is important to highlight that the support at $500 is significantly bolstered by the downside 1.272 Fibonacci Extension level (drawn in light blue) priced in the same area as well as the psychological support provided by the $500 round number level. If the sellers continue to push the market further lower then more support can then be expected at the .786 and .886 Fibonacci Retracement levels (drawn in green) priced at $461 and $437 respectively. The final level of significant support to highlight is located at the downside 1.414 Fibonacci Extension level (drawn in light blue) priced at $420. On the other hand, for our bullish scenario, if the buyers can regroup their efforts and push price action higher we can expect immediate resistance above to be located at the .236 Fibonacci Retracement level (drawn in green) priced at $591 followed by the previous 1.272 Fibonacci Extension level (drawn in blue) priced at $641.40. If the bulls can then continue to climb above the $646 handle we can expect higher resistance above to be located at the 1.414 and 1.618 Fibonacci Extension levels (drawn in blue) priced at $667 and $704 respectively. The RSI remains in the bulls favor as it trades above the 50 handles. However, the RSI is falling which may indicate that the previously strong bullish momentum is starting to lose some traction. So long as the RSI can remain above the 50 handles we can expect his market to continue to make some more gains moving forward. 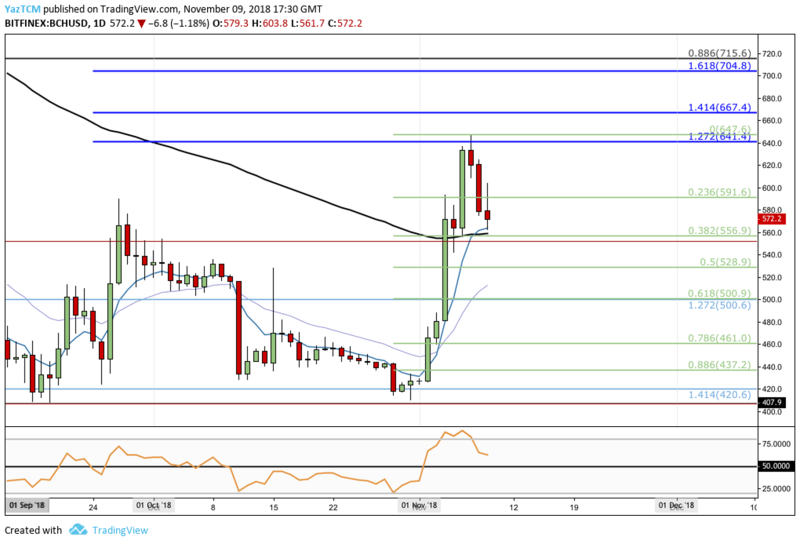 The post Bitcoin Cash Price Analysis: BCH Pulls Back Slightly After 57% Price Increase During The Start of November appeared first on Coingape.